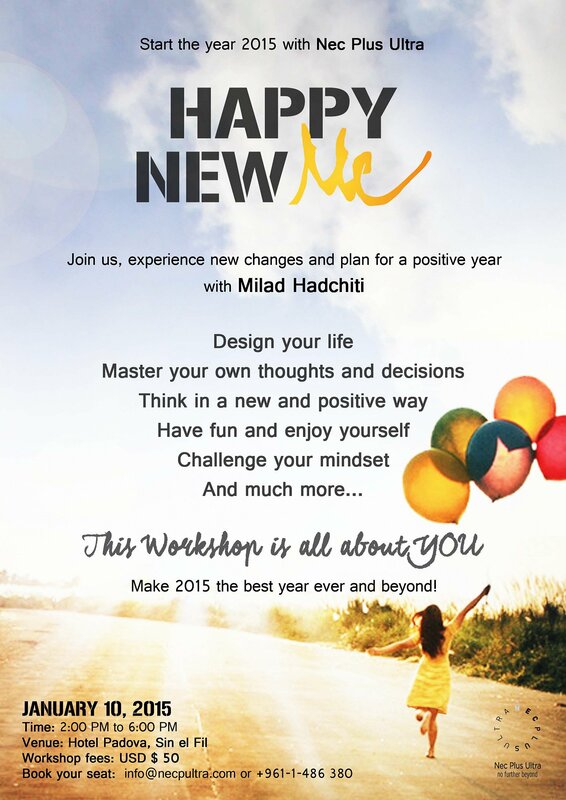 Happy New Me workshop is the best way to start the year! 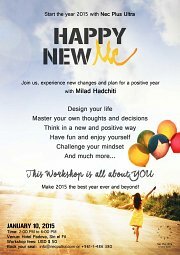 This workshop promises to bring positivity into people’s lives and to boost their motivation and determination to freshly start the new year 2015 and keep up with the same spirit throughout the year. This workshop is all about YOU, what goals you want to accomplish for this year, how to stick to your resolutions, and how to successfully make them happen. Join us on January 10, 2015 to celebrate the New You! It is time to make this year positive, productive and prosperous. Master your own thoughts and decisions. We invite you to watch our promo and to visit our website www.necpultra.com. This event is open for the general public. To book your seat, please contact Nec Plus Ultra Offices on 01-486380 or send an email to info@necpultra.com. Pre-registration is a must. Milad Hadchiti, Guru of Positive Thinking, Professional Life Coach, Certified NLP Master, Certified Image Consultant, Personal Branding Expert, Radio and TV Host, Motivational Speaker, and the Founder of Nec Plus Ultra, the first personal branding company established in Lebanon.